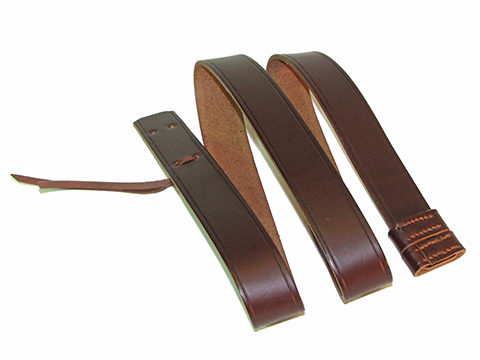 Pattern 1888 Lee Enfield rifle sling. Originally all the rifle slings were hand stitched. With the outbreak of WWI the restraints of time and cost made it necessary to use rivets. This is the stitched version of the sling. These slings are made from high quality Australian or Italian vegetable tanned leathers. The tie off lace is kangaroo leather.